Auburn’s wheelchair basketball team has been playing together for several years, but the Auburn Wheelchair Basketball Invitational planned for this weekend at Auburn Arena is a first. The tournament kicks off Sunday at noon and admission is free. 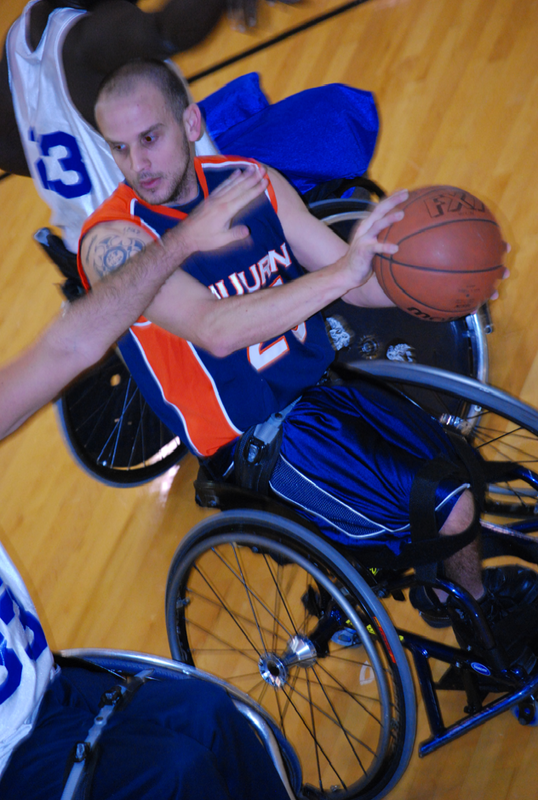 Auburn Wheelchair Basketball's Jared Rehm about to make it rain. The team is part of a new student organization, something player Jared Rehm hopes will garner the team more attention. The competitive team falls under the Adaptive Recreation and Athletics student organization, run through a partnership between the Department of Kinesiology and the Office of Accessibility. Rehm and Waters, the coordinator for the Adaptive Recreation and Athletics office, met when Rehm transferred to Auburn in 2009. They pitched ideas across campus to get support for a wheelchair basketball team. The duo found support from an off-campus advocate in Woody Thornton, who lost his legs in a 1989 train accident while he was a student at Auburn. Since then, Thornton has become an advocate for amputees, particularly in the realm of sports. “I felt led to start up an amputee support group that encouraged amputees to get out and get active,” Thornton said. Thornton’s group hosted several 5K runs and adaptive waterskiing sessions. Through a mutual friend, Thornton met Waters and Rehm and learned about their desire to start up a wheelchair basketball program for anyone in the community with a permanent physical disability of the lower limbs. The Auburn wheelchair basketball team is part of the National Wheelchair Basketball Association and playing in the Division 3 league, a recreational league where students and non-students can play. Teams across the country participate in the division. Rehm is trying to recruit players from the NWBA’s Junior Division in hopes of developing an intercollegiate team. There are currently seven programs competing in the college division of the NWBA, Rehm said. To move into the intercollegiate level, the games become more competitive and Auburn’s teams will gain more exposure by playing teams like Alabama, Missouri and Illinois. Clearly, Auburn needs one more way to show-up Alabama in a sporting event. But the league is not something players take lightly. Rehm, who was born with spina bifida, hopes this league is only the groundwork for what’s to come in adaptive sports. He’s hopeful anyone in the community with a disability to the lower limbs will join. Having a wheelchair isn’t a qualification. Rehm is able to get around with the assistance of a cane and has played sports most of his life. As a teenager, he found wheelchair tennis and basketball, excelling at both. He was in the Junior USA World Team Cup for tennis in 2004 and was able to compete in New Zealand. His basketball abilities landed him at the University of Wisconsin-Whitewater where he helped lead his team to a National Championship. He eventually found his way to Auburn where he’s currently a Ph.D. student in kinesiology. “I came to Auburn because my family is an Auburn family,” he said. Rehm said everyone likes the idea of having a team at Auburn, but that finding financial support for travel and equipment has been difficult. Camps Recreation gave the team court time for practice and the Concessions Board helped fund the purchase of seven sports wheelchairs, Rehm said. There’s even been an Adaptive Sports online class created, which filled up within three days of registration opening. With that kind of support, Rehm said he doesn’t want to stop with a recreational basketball league. Earth Fare will be hosting a wine tasting event tonight with proceeds going to the wheelchair basketball team. The event is $5 and lasts from 6-8 p.m. For more information on the team or league, visit facebook.com/auburnwcbb or auburn.edu/adaptivesports. You can also follow the league blog at auadaptive.org or follow the team on Twitter @auburnwcbb. Shepherd Center v. Lakeshore Foundation (from Birmingham): 2 p.m.
Auburn v. Lakeshore Foundation: 4 p.m.
Aubie will make an appearance at 1:30 p.m.
Related: Auburn man has tiger-striped legs. I thought this was Sunday, the article you published says saturday, I think we have a men’s basketball game already that day.